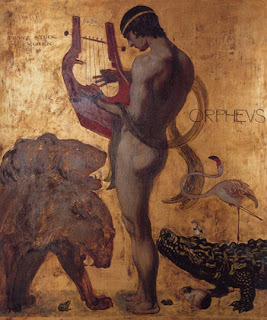 Seattle Opera Blog: ORPHEUS ODYSSEY - Week 2 Clues! ORPHEUS ODYSSEY - Week 2 Clues! 2/22 Update: This week's tickets have been claimed, at Dusty Strings in Fremont! We figured an instrument shop would be the perfect place to hide Orphée et Eurydice tickets--but where will we hide next week's pair? That's top secret, but come back on Monday for another round of clues! Originally posted on Monday, February 21, 2012, at 10 a.m.
There’s something a bit bovine about this sunbeam and litigator. Know which business this is referring to? If so, a pair of tickets to the March 10 performance of Orphée et Eurydice await, available for claiming this week from 10 a.m.-6 p.m. this Monday through Saturday, or 12-5 p.m. on Sunday. Could you explain those clues, now that the answer has been revealed? Sure, the tickets were being held at Dusty Strings, a music store in Fremont. Today's clue puns a bit on the name of the store ('strings' are a kind of subatomic particle); yesterday's clue refers to Dusty Strings' reputation as a great place to get your dulcimer (origin of word: from Latin "dulces" plus Greek "melos") repaired, plus the fact that when you enter the store, when it opens the door strums an mountain (or Appalachian) dulcimer that's overhead; and the trickier clue from Monday punned on the names of the couple who founded the business, whom you can meet at http://www.youtube.com/watch?v=tsDZs_deCqk. If the tickets hadn't been found today, we'd have gone tomorrow with our planned Clue #4, "Orpheus Descending here for lyre repairs"!